As I sit here in front of my CUDA dev system, I have three video cards: Two GTX470s, and a GTX580. All of them are running their fans at high speeds, and my current GPU temperatures (while idle) are: 34C, 33C, 25C. The trick is that I only have a display attached to one card! It's been known for a while that, for whatever reason, nVidia doesn't let you control the fan speed of cards without monitors attached using the Coolbits tweak. This is really very annoying for those of us with CUDA dev boxes or production boxes that have a ton of video cards we would like to keep cool. Fortunately, there IS a way around it - at least for boxes running X11. I've not found a way to make this work on a purely headless production box yet, but if you have X11 up, you can control all your fans! The trick is that while nvidia-settings will not let you control the fan speed of headless cards, you can force x11 into thinking the cards have heads on them! I've got two methods proposed: The "easy" method, and the "geek" method. Both should end up at the same point, just via different paths. The end goal is to have xorg.conf set up such that a monitor is "attached" to each card. I had to reboot a few time to get this to work, partly because I only had one extra monitor to attach. 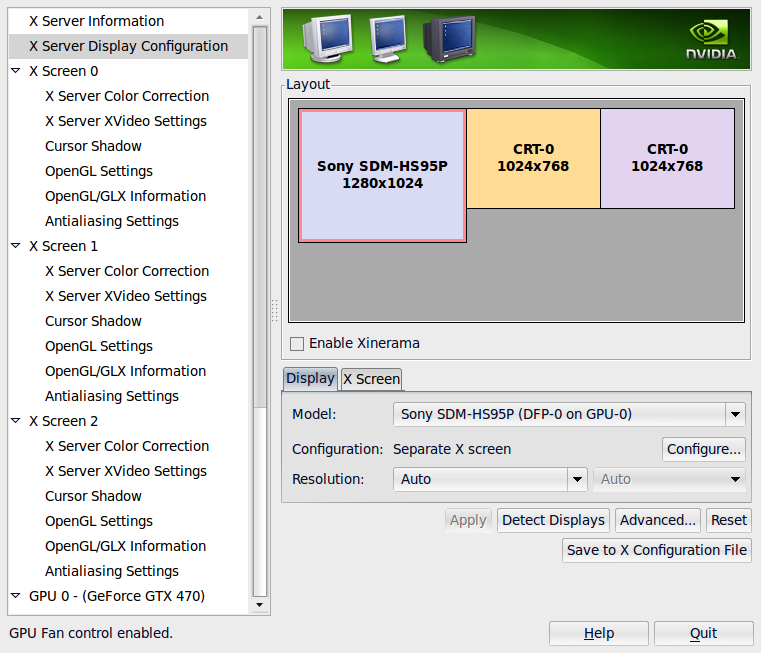 However, once I got this set up, I was able to detach the secondary monitor from the cards. After setting up each display like this, I set up my xorg.conf file to force the monitors to be "connected" - and to turn on the fan control settings in Coolbits. 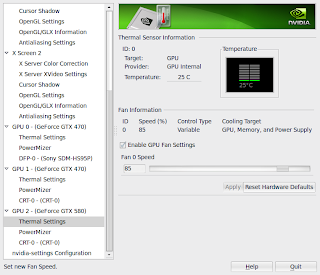 Do this for all the screens you have, reboot, and you should be able to force fan speed in nvidia-settings in the thermal management screen. This involves creating an xorg.conf file that has all the other cards added with the needed sections by hand. I'm not sure why you'd want to do this, but you can. I now know the PCI IDs of my video cards: 01:00.0, 02:00.0, and 05:00.0. At this point, I'm assuming you're familiar enough with xorg.conf to handle the needed configuration modifications for each card on your own (needing to use different monitor and device IDs). You will likely already have one entry in your xorg.conf from your primary display. You can simply copy and modify these to create the needed sections for each card you wish to control the fan on, or can create custom settings. Given that the whole point of this is fan control, you'll probably want to enable Coolbits! Not all of this is required, but this is what my settings are, and it works perfectly. 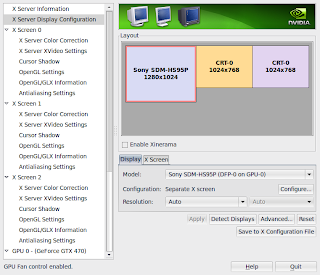 Restart X11, bring up nvidia-settings, and you should be able to control all the fan speeds manually! As a side note, I cannot force the fan above 85% on my eVGA GTX580. I'm not sure why, and I believe there is a BIOS flash that will let me force it to 100%, but for now, I'm happy with 85%. It keeps it cool enough. My next post will discuss some command line utilities for nVidia and some scripts I use to automate setting my fan speeds. Hello: Very interesting, but I have not achieved good results. Tendo installed a GTX 450 + screen, activated fan control and a GTX590 (no screen) and I want the fan control the GTX590. You can see how your xorg.conf has cofigurado parqa work. Thank you.